Did you know yellow is one of the colors cats and dogs can see best? I guess that’s why my favorite toys are yellow and yellow is this week’s PhotoHunt theme at the WhistleStop Cafe. It all fits together nicely just like The Cat likes it. OK, so there’s no yellow nip in this post but I bet the title caught your attention. Everybuddy knows about how much I love my yellow foam rubber rockets. They’re legendary. Let me tell you about my yellow feather wand toy. It was one of my gifts last Christmas from Aunt Pauline. She’d bought it for her cats but one of them was deathly afraid of it. Their lose is my gain. Make no mistake about it. I don’t actually play with said feather toy. It’s my prey. My hunted. After the peeps go to bed, I drag that feather to the bedroom like it’s something I’ve caught. I drop it outside the bedroom so proudly. TW says I make some pretty weird noises with it in my mouth. HAH! The wand on this feather toy is about three feet long so you can imagine how I look dragging it through the condo! It isn’t easy. If it’s laying on the couch, I’ll carry it down. TW would LOVE to get a video of me carrying the feather toy! 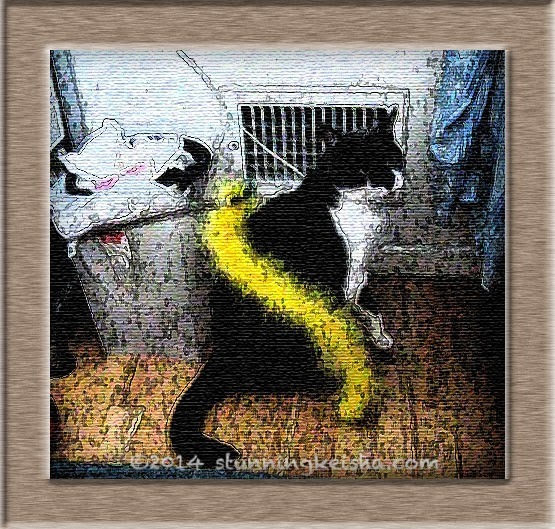 Since I refused to pose with the yellow feather toy—and, believe me, TW chased me all over the condo with the toy in one hand and the flashy box in the other—we decided to make the one grainy, dark photo she did get into our piece for Athena & Marie’s Caturday Art Blog Hop. 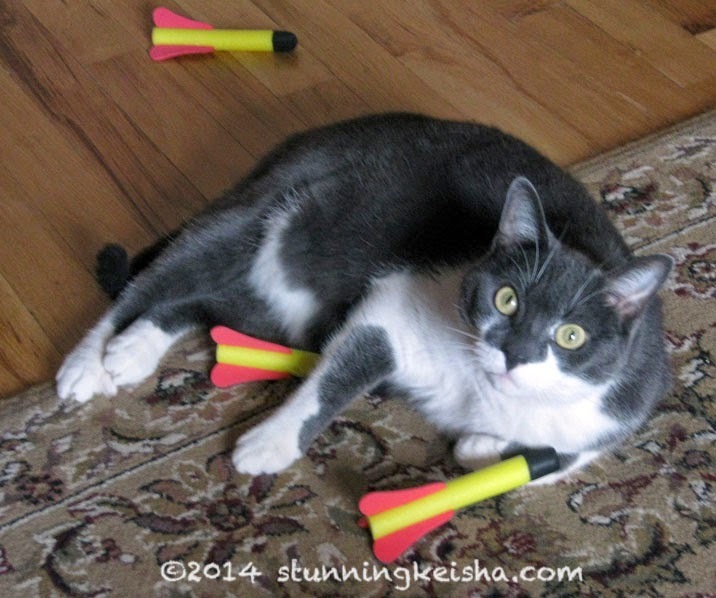 You don’t have to be a cat to showcase your talents in this Blog Hop. As you can see, the yellow feather still stands out against my grey furs. We used both the dark brush stroke and a canvas texture in PhotoShop and then framed it with the wooden frame action. I bet that thing is really FUN to hunt! We can just picture her chasing you all over the place to try and get the photo! Have fun with those yellow toys! The art image is beautiful! Yellow color goes very well on your coat! LOL CK we can just picture TW trying to get a shot with the flashy beast. Great camera avoidance technique there pal. Have a super Saturday. That was cool CK! Now we know why we love the nip nanner so much! It's the only yellow toy around. I did not know that about yellow! I'll have to keep that in mind when purchasing kitty toys! Video! Video! We need late night yellow feather video! CK great effects terrific way to combine both art hops! Oh, we want to see a video of you with your favorite prey! The yellow feather toy looks wonderful on you! I can see why you like to carry it around. Vewy cool. ☺ Purrlease be caweful wunnin wiff da wand. Mommy saw a kitty dat had been skewewed wiff da wand fwum just such a toy aftew playin' wiff it on der own and wunnin intu a wall. Nice picture! Has somebody been launching rockets at you? Your artwork always looks amazing! that photo is beyond cool! Me thinks that you and Katiebella do some similar things with bringing something into the bedroom at night. That's pretty cool. I'm too lazy to do that so my peeps have never had that honor. Yellow looks good on you, CK. Very cool effect, I didn't know that about yellow. Mom never knew about the yellow. Now she knows, I hope she gets me some yellow toys! We would love to witness this too, we bet it is so adorable! Love the art effect of you and your favorite fevvers, CK! CK I really love those rockets of yours and I too would QUITE enjoy seeing you drag that 3-foot long yellow feather thingie around your condo. That would be quite a "movie" indeed. Sorry I haven't been by lately - for some WEIRDO reason I'm not getting email notices on my Blogger blog buds. Unfair! Protest! I saw some rockets in the same little catalog where we both limey got our red and white striped vip candy bar. I was tempted to get mom to buy them for me. One of the best things about artifying something is you can take a bad pic and make it look like a gorgeous piece of art. --Purrs (and wags) from Life with Dogs and Cats. Oh yes CK - we sure can relate to those funny noises when we catch our prey for our humans! We also have a feather toy here... Jazmine loves to drag that thing around! Purrs from the Zee and Zoey Gang! We love those rockets, great photo! I bet TW looks pretty stoopid panting around after you! !